cared of piling on the pounds over the holidays? Your easy-to-follow muscle building advice ensures only the goose gets fat this Christmas! It's the holiday season, and you're concerned you might undo all your hard work in the gym? Our site has put together some muscle building advice to keep you in tiptop shape during the festive period, and long into the New Year. 1. A partridge...in your recipe. Instead of the usual chicken for your protein choice, why not go with something a little different like this game bird? A partridge packs plenty of flavour for its size, and will provide your body with all the essential amino acids. Just be careful climbing any pear trees! 2. Two...ninja turtles. Just like Leonardo's artist namesake, don't be afraid of getting creative over the holidays. Oftentimes, a change of exercise or new routine, will provide the impetus to greater gains. For example, why not substitute your trusted squat for the deadlift exercise? This compound movement will get you strong all over, as it works just about every muscle in your body. Practice high intensity bent-legged deadlifts or the stiff leg deadlift once a week, and enjoy a big ninja-style step forward in your progress. 3. Three...French presses. If the traditional bench press is failing to tickle your triceps, why not try the French press over the Christmas season? Exercise variation can be a good thing, and will often freshen up a workout that has grown stale. Just remember to practice perfect lifting form with your presses, and add weight to your bar slowly. Oo-la-la! 4. 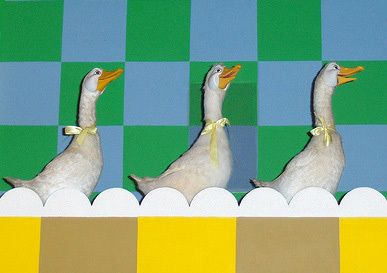 Four...geese are shrugging. Few trainees practice the barbell shrug anymore, which is a shame, as the shrugs exercise is a proven muscle builder. For proof, consider how weight lifting sensation Joseph C. Hise has helped the average trainee get big and strong for over 50 years, often getting those who followed his program to "...junk all their clothes..."
His program, and the shrug exercise, can do the same for you. 5. Five...golden routines. Finding an abbreviated routine that fits you is easy when following sound advice. Most importantly, make sure your choice of routine utilizes the best core exercises. Despite what you may have read in the glossy magazines, you CAN build an impressive physique using no more than a handful of exercises. These exercises - alternated wisely - can provide you with all the muscle building armory you will ever need. Scared of piling on the pounds over the holidays?